In 2012, Counsilman-Hunsaker, in association with Ratio Architects, was retained by the Shelbyville Central Schools to conduct a swimming pool audit for the Shelbyville Middle School natatorium and the Shelbyville High School natatorium. The audit evaluated the existing conditions of each pool, its equipment and amenities, including life expectancies and recommended short-term and long-term repairs or replacements. In addition, construction costs were provided for recommended repairs bringing the pools up to current public swimming pool regulations. A preliminary concept at each site was developed to help determine the feasibility of having a larger pool to meet the growing needs of the district. Due to the condition of the lap pool and the cost of repairs, Shelbyville Central Schools decided to move forward with the replacement of the existing main swimming pool at Shelbyville High School. In 2014, the pool was replaced with a 6,800 sq. ft. eight lane, “stretch 25” competition pool, including new mechanical systems. 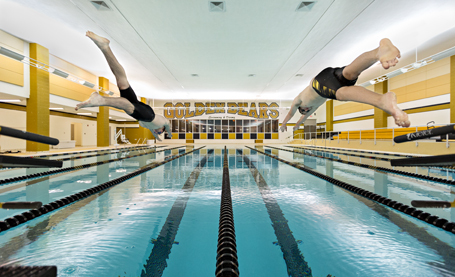 Features include a stair entry, two 1-meter diving boards and a moveable bulkhead allowing staff to configure the pool where instructional, recreational, and fitness sw imming, and can occur with team practice simultaneously.